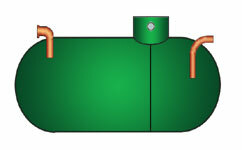 Septic Tanks are two chambers units designed, in accordance with BS6297, to separate waste solids from waste liquor. The solids remain in the first chamber from where they are periodically de-sludged whilst the liquor is displaced to a subsurface irrigation system which should be suitable sized by means of a percolation test as detailed in PPG4 and BS6297. The horizontal septic offers both easier access for maintenance and the opportunity of installation savings compared to a spherical unit of the same capacity. Aluline Environmental Solutions can offer additional capacities and different dimensions to those shown on this page. Contact us on 0844 7701555 if you have any particular requirement.